Showers and celebrations with friends abound this time of year. Show us your healthy, colourful drink concoctions for festivities like bridal showers and graduation celebrations. Now challenging a FODMAP is probably not something you want to do as part of a bridal shower, but it is a delicious way to celebrate your graduation from the elimination phase to the challenge phase of the low FODMAP diet. The challenge phase is the second phase of the low FODMAP diet. The main goal of this phase is to find out which FODMAP groups are your biggest triggers & which FODMAP groups do you tolerate well. During this phase, you will also learn the difference between mild, moderate and severe symptoms and importantly how to challenge a food to get accurate and reliable answers. This new found knowledge will guide you towards learning how to live & eat like a normal person. 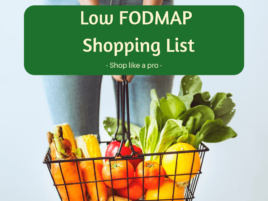 You can read more about the 3 phases of the low FODMAP diet here. 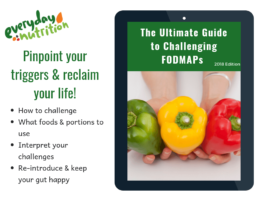 Begin challenges once you have been on elimination for 2-6 weeks and have determined that removing FODMAPs does significantly reduce your symptoms. Make sure symptoms are well managed before commencing a challenge. At this point you are testing the FODMAP groups, not the foods. It is important to choose foods carefully and use ones that only contain one fodmap group. For example, an apple contains fructose and sorbitol, if you react to an apple, you wont know which FODMAP is the problem. However, a mango only contains fructose, if you react to a mango, you will know that is was the fructose that triggered you. Keep the rest of your diet low fodmap so as not to cloud results. Begin with a small amount of the test food and increase slowly over 3 days. If you react: If you are reacting, you can stop the challenge. Take the test food back out of the diet and wait until the reaction goes away. Wait until you feel well again. Then have at least three days with no or minimal symptoms before starting the next test. If you do not react: If there is NO REACTION during the challenge, you can consider the challenge complete. You still need to stop eating the challenge food and wait 3 days before beginning the next challenge. Challenges are completed over 3-6 days. Each challenge starts with a small dose of the test food which then increases in over a few days. ​There are two options for a challenge schedule, you can choose whichever one you feel suits you best. Join the Everyday Nutrition online group challenge.